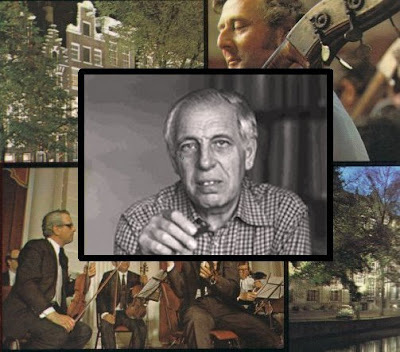 The Dutch composer Lex van Delden died on July 1, 1988. I first came across his music in 1972 when it was used in the title sequence of a BBC Television programme about the Concertgebouw Orchestra, and my photo montage above shows van Delden against a background of stills from the programme. Born Alexander Zwaap in 1919, as a Jew van Delden played a courageous role in the Dutch resistance against the Nazis, but suffered the loss of almost his entire family in the Holocaust. After the war he found work through his wartime contacts as the resident composer and music director of the first post-war Dutch ballet group, "Op Vrije Voeten" ("On Liberated Feet") and from 1947 as the music editor of the daily, originally underground, newspaper "Het Parool". Most of his pre-war compositions were destroyed during the accidental bombing of Nijmegen in 1944 by the U.S. Air Force and the first of his works to attract wide attention was Rubáiyát (nine quatrains by Omar Khayyám in an English translation) for chorus with soprano and tenor solos, 2 pianos and percussion which won the prestigious Music Prize of the City of Amsterdam in 1948. He also achieved recognition in North America when he won two awards from the Northern California Harpists' Association, for his Harp Concerto (1951/'52), in 1953, and Impromptu (1955; for harp solo), in 1956. Van Delden's music addressed subjects of social concern including his In Memoriam (1953; for orchestra), which was written in the aftermath of the great flood disaster of 1953 in the Low Countries and England, the oratorio The Bird of Freedom (1955), which is an emotional cry against slavery, the radiophonic oratorio Icarus (1962), which questions the usefulness of space travel, and Canto della Guerra (after Erasmus, 1967; for chorus and orchestra), which is a strong condemnation of war. Although his music was tonal in the widest sense, van Delden worked energetically on behalf of contemporary composers and sat on the Board of the International Society for Contemporary Music (I.S.C.M.). Despite early recognition and a large body of published compositions which reaches Opus 114 van Delden's music is little known outside Holland. But high profile musicians have championed his work including Bernard Haitink, Eugum Jochum and George Szell, all of who are represented on an excellent Etcetra CD devoted to his music. The four works on the disc, all live concert recordings with the Concertgebouw Orchestra, are the Tippett indebted 1961 Concerto per Due Orchestre D'Archi, the spiky Stravinsky flavoured 1960 Piccolo Concerto scored for twelve winds, timpani, percussion and piano (both under the baton of Jochum), the single movement 1967 Musica Sinfonica (with Haitink) which needs no justification and is surely the composer's masterpiece, and the intense fourteen minute 1955 Sinfonia No. 3 'Facets' (with Szell). Some great and demanding conductors programmed van Delden's compositions with one of the world's leading orchestras. Let us hope the twentieth anniversary of the composer's death finally brings the international attention his music deserves. The Lex van Delden Foundation website includes a biography, catalogue of works and discography, and his publisher , Edition Peters, can be found here. Now read how contemporary music goes Dutch. Lex van Delden was, besides a composer, a music critic, who had no affiliation with most post-war developments in "serious music". "controlled" the contemporary music scene, Lex van Delden's music was banned from the concert halls. His son (also named Lex van Delden, and not Lex Zwaap!) is a famous actor in the Netherlands. My hobby classical lp blog. Rolph, thanks for the additional information, I had wondered if there was a link between the composer and the actor. Hindsight is wonderful, and your email would have provided a better headline for my article - 'A contemporary Beckmesser'. Thanks for this, It was completely new to me and I'm intrigued. Perhaps Rolf den Otter ought to have his ears cleaned out: one only needs to listen to Dabringhaus und Grimm's superb releases of Lex van Delden's chamber music, performed by members of the Royal Concertgebouw Orchestra, and of his complete string quartets, played by the Utrecht String Quartet, (or indeed to the Etcetera disc devoted to four of his orchestral works) to realise that he is a major composer, whose life-affirming music fully deserves international attention, as "On An Overgrown Path"'s Editor has argued so eloquently!